← When reality isn’t real – or is it? Whenever a new Anne Perry Victorian novel arrives, I know I am about to be immersed in another place and time, a place that is sometimes heartbreaking and grim, but always fascinating. Perry out-Dickens Dickens in exposing the social ills and inequities of the Victorian age in England. And she makes you eager to read, willing to bear the stark reality, by wrapping it all into a gripping mystery with strong characters you come to regard as your friends. Perry keeps two fine Victorian series going, each with a husband-wife team. This is a William and Hester Monk novel. ACCEPTABLE LOSS. By Anne Perry. Ballantine Books. 305 pages. $26. As William Monk has moved into his job as head of London’s River Police, he has learned that the mighty Thames – the river and the waterfront – is a world all its own. The river is a watery highway, carrying all kinds of people and goods. Criminals find refuge there. The murky waters are a good dumping place for bodies. And who knows what terrible things happen on some of those boats gliding into hidden bends, floating along with the tides? When the body of Mickey Parfitt washes up, it’s hard for anyone to care. Parfitt was a despicable character, and the world is no doubt better off without him. But society must deal with murder, and Monk knows that there’s a story behind the elegant silk tie that was used to strangle Parfitt. Inquiries must be made. Like the river itself, Pitt’s investigation takes on momentum of its own, taking him around bends and into areas he’d just as soon avoid. Parfitt’s death seems to be related to a particularly disgusting enterprise – a boat on the Thames where wealthy men pay to watch half-starved young boys perform perverted acts. And the suspects in his murder include prominent people. A mistake could prove costly for Monk’s career, a career that’s already been impeded by a stinging defeat in the earlier trial of Jericho Phillips, a child pornographer. Monk’s wife, Hester, a former military nurse who routinely works with London’s lost souls, lends a hand. This time, she has a stake in the case not just because she cares about society’s outcasts and wants to help Monk, but also because the outcome is important to Scuff. Scuff is an abused boy she and Monk have taken into their home, and securing his trust is essential. It’s all here: a painstaking investigation, danger both professional and personal, and richly detailed descriptions of Victorian London. Finally, Monk finds himself back in the courtroom, in a mesmerizing trial that will determine more than one man’s guilt or innocence. Anne Perry is a fine writer with deep insights into human nature. She exposes some of the dark corners, some of the depths we’d perhaps rather pretend don’t exist. But in the end, she affirms the efforts of those who believe that things can be better and work to make it so. Like the river itself, Pitt’s investigation takes on a momentum of its own, taking him around bends and into areas he’d just as soon avoid. It’s all here: a painstaking investigation, danger both professional and personal, and richly detailed descriptions of Victorian London. Ultimately, Monk finds himself back in the courtroom, in a mesmerizing trial that will determine more than one man’s guilt or innocence. 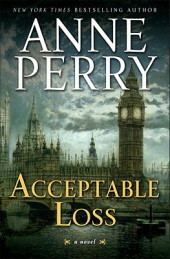 Anne Perry is a fine writer with deep insights into human nature. She exposes some of the dark corners, some of the murky depths we’d perhaps rather pretend don’t exist. But in the end, she affirms the efforts of those who believe that things can be better and work to make it so. This entry was posted in Historical Fiction, Mysteries and tagged Anne Perry, London, Mystery, William Monk. Bookmark the permalink.